This is the orange version of the famous Club Tattoo playing cards. The artists at Club Tattoo, one of the most famous tattoo and body piercing studios in the world, designed the original art on every card in this colorful deck. Club Tattoo founders Sean and Thora Dowdell, and Chester Bennington of Linkin Park, sat down with Club 808 to talk more about the inspiration behind the deck. Each suit is its own style of tattoo art, including skulls, traditional Japanese, Day of the Dead, and traditional tattoos. 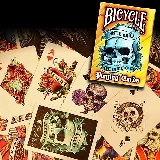 The Club Tattoo Deck contains original artwork on the front and back of each card and the tuck. Made in the USA at The United States Playing Card Company on premium stock with a quality finish.